Researchers from the Université de Strasbourg (France), in collaboration with the Humboldt-Universität zu Berlin (Germany), Stanford University (USA) and the Université libre de Bruxelles (Belgium), demonstrated that high-performance optically switchable field-effect transistors can be developed by blending photochromic molecules with small organic semiconducting molecules. Such multifunctional organic devices are considered as key elements in future logic circuits. These results have been published in the journal Nature Communications. Organic optoelectronic materials attract particular attention for the development of low-cost multifunctional devices, such as photo-transistors and optical memories. In these devices, light is used as a remote control to modulate electrical properties. 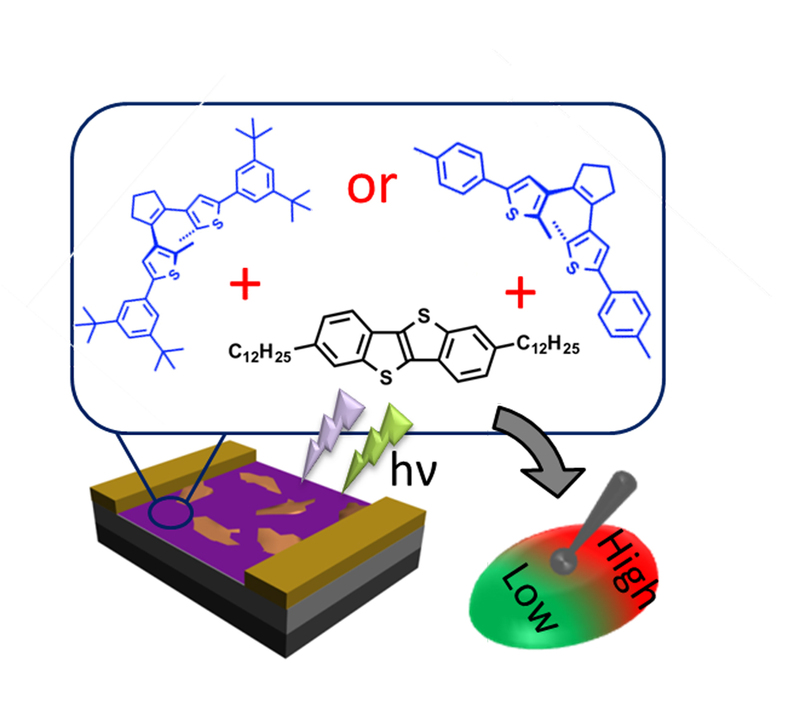 In particular, conductivity can be tuned by incorporating photochromic molecules, which are able to undergo a reversible light-induced interconversion between several isomers possessing markedly different physical and chemical properties. Diarylethenes (DAEs) are among the most interesting photochromic molecules to be embedded into thin-film transistors (TFTs) as a single semiconducting component. However, thin films made solely from DAEs suffer from rather poor charge transport properties. This problem can be solved by blending the DAE with organic (semi)conductors such as polymers in order to combine the light responsive nature of the DAE with the advantageous charge transport characteristics of the respective matrix component as reported in a seminal work from the same group at the Université de Strasbourg & Humboldt University Berlin. This raised the question whether the approach of blending DAE with a polymer is general and also applicable to small semiconducting molecules which are known to exhibit greater device performance when integrated in thin-film transistors. Therefore, in this study, the researchers explored the effect of supramolecular organization mediated by the specific substitution pattern of the DAE (i.e. DAEs possessing markedly different alkyl substituents tert-butyl vs. methyl) on its photoswitching behavior when incorporated in both polymeric as well as small molecule matrices. Poly(3-hexylthiophene) (P3HT) was chosen as a model polymeric semiconductor, and a benzothienobenzothiophene (BTBT) derivative decorated with C12 alkyl chains was selected as the small molecule semiconducting matrix due to its exceptional electronic characteristics and solution processability. This group of researchers was able to fabricate BTBT based optically switchable transistors with charge carrier mobilities as high as 0.21 cm2·V-1·s-1. Their results show that the molecular design made it possible to control the interactions between the blended components and thus the structure/morphology within the films ultimately affecting the charge transport in the device as well as the current photo-modulation and hence the overall switching performance. 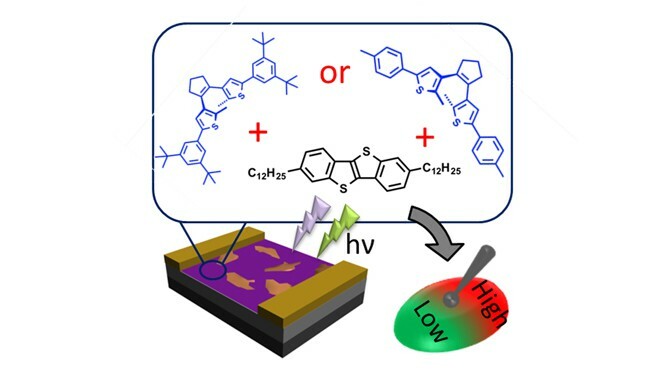 They demonstrated that small molecule semiconductors can indeed outperform their polymeric counterparts in photoresponsive electrical performance when blended with DAE photochromic molecules in TFTs. Both DAE substitution pattern – which controls thin film morphology – and irradiation conditions – which need to maintain reversibility – turn out to be critical parameters for optimization. These results prove that the blending approach they used is generally applicable to organic semiconducting molecules and can be tuned to fit the priority function of the device in question. These findings are attractive for the development of high-performing optically-gated electronic devices for potential applications in memories and logic circuits, and more generally in optoelectronics and optical sensing. Schematic illustration of the field-effect transistor based on blends of photochromic molecules bearing different alkyl substituents blended with a small molecule organic semiconductor. This blend results in high or low performance switch under illumination depending on the photochromic molecule.